Fantagraphics has been translating Jacques Tardi books for a while now, and this week we get to see what happens when Tardi gives a shot at the "Icepunk" genre in The Arctic Marauder. 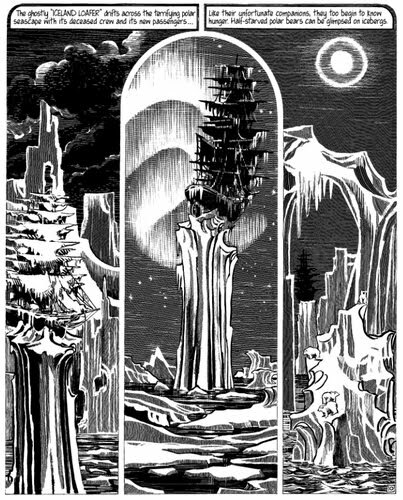 At once a parody and a tribute to late 19th, early 20th century mystery/adventure Jules Verne-esque fiction, this gorgeous one-shot is masterfully drawn scratchboard style, as if to echo the woodcuts of the era. The result is sumptuous. Just look at those elegant art-nouveau panels! Marauder was released two years before Tardi started writing his highly acclaimed Adèle Blanc Sec series (which Fantagraphics also translates - volume 2 is out this fall!). 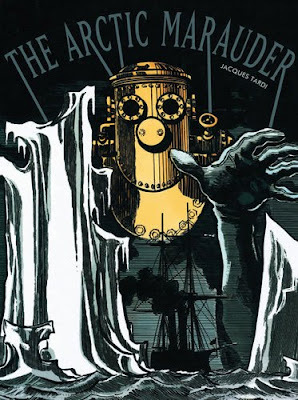 Its story revolves around the young Jerome Plumier and his quest to find his missing scientist uncle, who seems to be connected to the many mysteries surrounding a ghost ship perched atop an iceberg in the Atlantic ocean. Fans of concentrated mysteries, steam-operated machines, dramatic adventures and over-the-top villains should be all over this!